The TopDown Engine provides an advanced AI system that will help you create all sorts of interesting patterns and attitudes. For a brief overview of what you can do with it, you can have a look at the MinimalAI demo scene, which will showcase a tiny portion of the things you can create with this system. 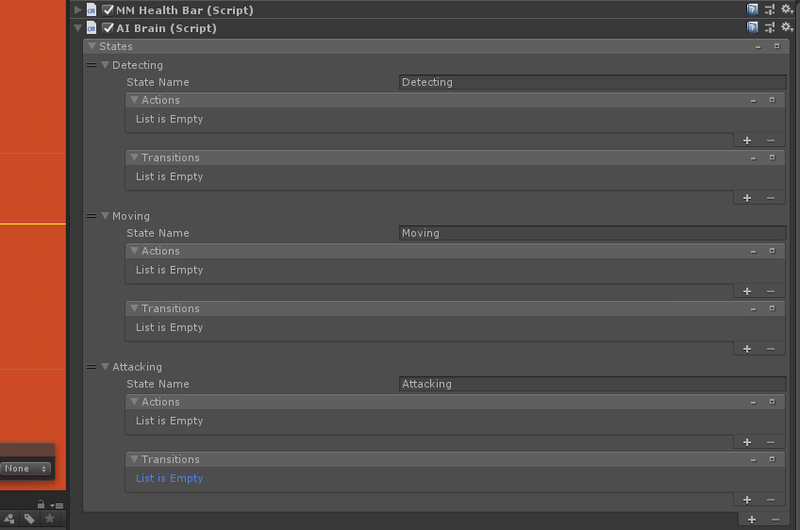 An example of an Advanced AI powered character's inspector, complete with its brain, three actions and one decision. We’ll recreate one of the example characters available in the KoalaDungeon demo scene, the NinjaSwordMaster. Creating the base character is no different from creating any character, so we won’t go over that again here. 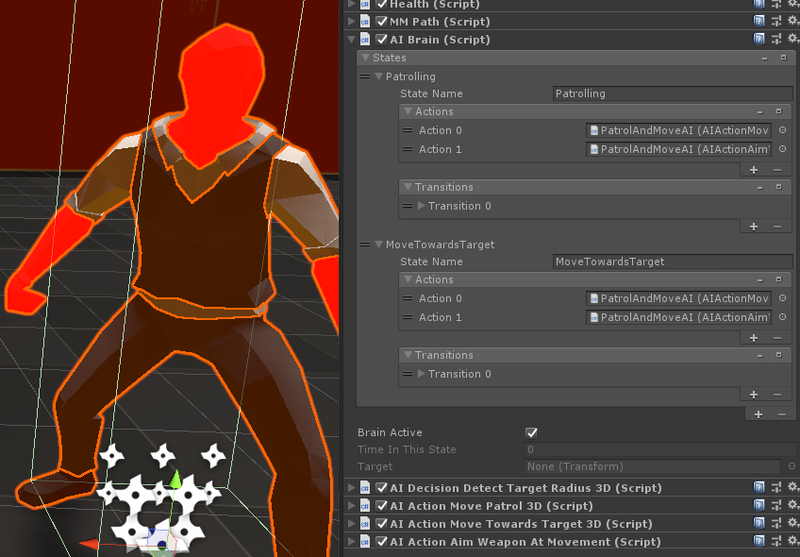 Once that base character is ready, you’ll want to add an AIBrain to it. What we want from this character is the following behaviour : do nothing until an enemy gets close enough, and if that’s the case move towards it, and attack if close enough. Then if the target gets out of range, get back to doing nothing and waiting for a target. AIDecisionDetectTargetRadius2D : we define our radius (7 in the example), our target layer should be Player, and we want to use the Obstacles layer as our Obstacle mask. AIDecisionDistanceToTarget : we want to have this decision return true if the distance is lower than 2, so we set our comparison mode to “lower than”, and our distance to 2. Our character now has all the actions and decisions we need to define its behaviour. All that’s left to do is plug all that into its brain. As stated before, our character will have 2 states : patrolling and attacking. So in its AIBrain component, we’ll simply add three states by pressing the bottom right “+” sign three times. We’ll name our first state “Detecting”, our second state “Moving”, and our third state “Attacking”. Now in the Detecting state we’ll only have one action, and one transition, so we’ll add an Action and a Decision by pressing their respective “+” signs once each. 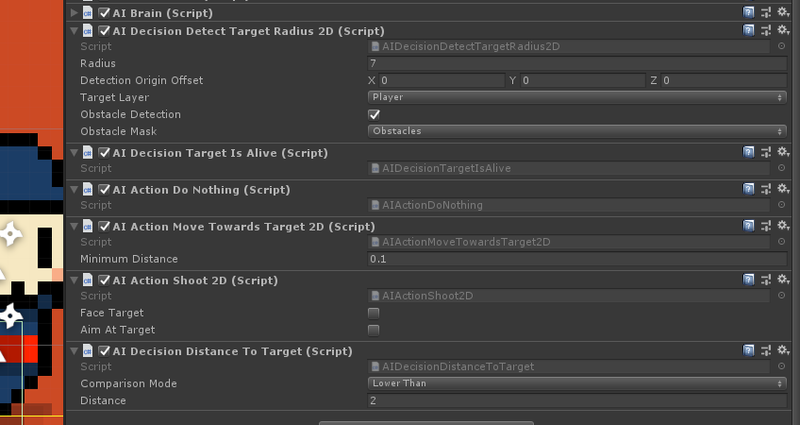 We’ll now drag our character’s AIActionDoNothing component into the Actions’ array slot, and we’ll drag the AIDecisionDetectTargetRadius2D into the Transitions’ first Decision slot. We want to switch to moving when the player is in range, so we’ll put “Moving” in our transition’s True State field. We’ll proceed in the same way for our second state : we’ll add an action and, this time, three transitions, then drag our AIActionMoveTowardsTarget2D component into our Moving state’s Action slot, and then move our AIDecisionDetectTargetRadius2D into the first transition’s detection slot, AIDecisionTargetIsAlive into the second transition’s slot, and finally AIDecisionDistanceToTarget in the 3rd transition’s slot. When the target is not in range anymore we want to go back to Detecting, so we’ll put Detecting in our first transition’s false state, and we also want to go back to detecting when the target is dead, so we’ll put Detecting in our second transition’s false state slot. And if the distance to target is low enough, we want to attack, so we’ll put Attacking in our 3rd transition’s true state slot. In our last state, Attacking, we’ll add one action and one transition. Then we want to drag our AIActionShoot2D in the Action slot, and AIDecisionDistanceToTarget into the transition’s decision slot. If that distance is too high, we want to go back to Detecting, so we’ll put Detecting in the false state slot. To make sure our brain is properly setup, we can just “read” it. From top to bottom, we have a character that is doing nothing, while waiting until a target gets within its radius. Then it starts to move, unless the target is dead or too far / out of sight. If, however, the target is close enough, it will attack, and go back to detecting if the target gets far enough. Congratulations, you’ve completed what is probably the “hardest” thing to do with the TopDown Engine, and you now know how to create all sorts of character behaviours. You can of course have more than one action in a state (running and jumping for example), more than one decision in a transition, and more than one transition, so you can really come up with complex stuff. AIActionAimWeaponAtMovement : will force the weapon aim to the movement’s direction. AIActionMoveTowardsTarget2D/3D : directs the CharacterHorizontalMovement ability to move in the direction of the target. AIActionShoot2D/3D : shoots using the currently equipped weapon. If your weapon is in auto mode, will shoot until you exit the state, and will only shoot once in SemiAuto mode. You can optionnally have the character face (left/right) the target, and aim at it (if the weapon has a WeaponAim component). AIDecisionDetectTargetLine2D : will return true if any object on its TargetLayer layermask enters its line of sight. It will also set the Brain’s Target to that object. You can choose to have it in ray mode, in which case its line of sight will be an actual line (a raycast), or have it be wider (in which case it’ll use a spherecast). 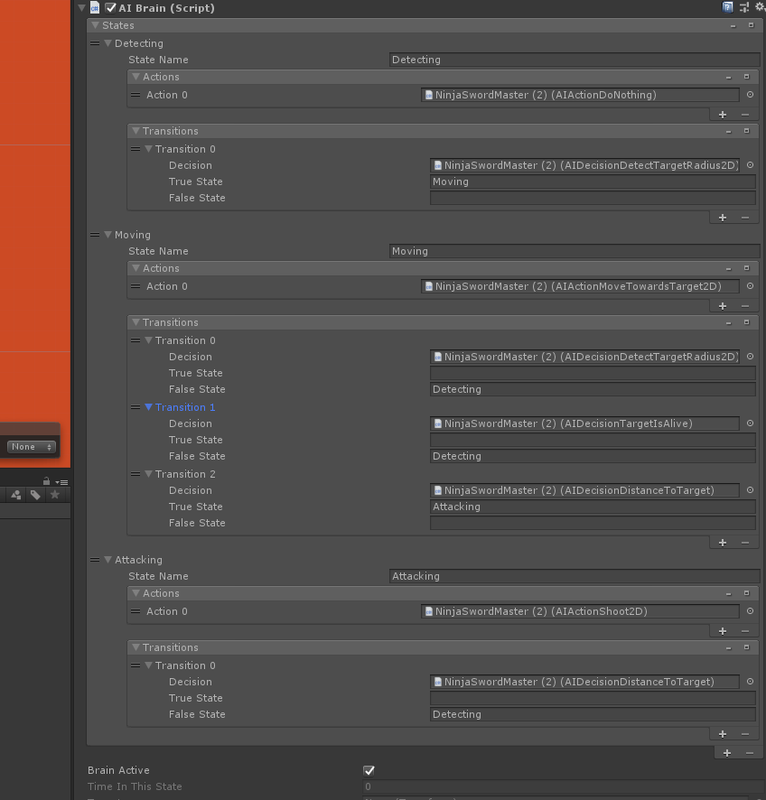 You can also specify an offset for the ray’s origin, and an obstacle layer mask that will block it. AIDecisionTargetRadius2D/3D : will return true if an object on its TargetLayer layermask is within its specified radius, false otherwise. It will also set the Brain’s Target to that object. AIDecisionDetectTargetConeOfVision : uses a field of view to determine whether or not a target is in view. Returns true if that’s the case. AIDecisionTargetFacingAI2D : will return true if the Brain’s current target is facing this character. Yes, it’s quite specific to Ghosts. But hey now you can use it too!